You want to perform the front squat with a barbell, solely for the reason that you can load more weight onto a barbell than you can handle with a set of kettlebells or dumbbells. 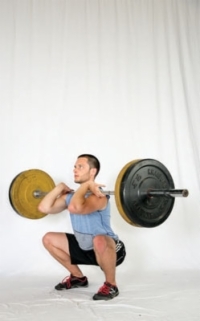 But other than the amount of weight, and the placement of the weight, the movement pattern is identical to the goblet squat or racked squat — so don’t move too hastily onto the front squat until you have those two movements mastered. To perform the front squat, you also need a rack to hold the barbell in between sets. 1Set up under the barbell so it lies across the front of your shoulders just above your clavicle and close to your throat. Hold the barbell with a clean grip — where your fingers loosely grip the bar just outside of your shoulders while you drive your elbows up and in until your forearms are parallel with the ground. Support the weight with your body, not your arms; the clean grip simply acts as a placeholder for the weight across the front of your shoulders. 2Stand up out of the rack, and step away. Get in the habit of taking as few steps as you need to find your squatting stance — there’s no point in wasting time or energy messing around with your stance. 3Take a deep breath into your belly and start your squat. As always, keep your back flat, heels on the ground, and knees in line with your toes. It’s imperative to keep air in your belly when under load. Breathe out while pushing your tongue against the roof of your mouth when coming out of your squat (to maintain intra-abdominal compression), but just don’t breathe all your air out. 4When you’ve hit your maximum depth, push your heels into the ground and drive your hips forward to stand up and finish the movement. You’re not done with the front squat until the barbell is placed safely back on the rack. Just because you have completed the rep doesn’t mean you can relax. Stay tight and maintain good form the entire time you’re under the bar.